Shopify Academy: Earning Five Figures Per Month via Shopify Store Dropshipping the Right Way (English Edition) eBook: Tony Lenard: Amazon.fr: Amazon Media EU S.à r.l. 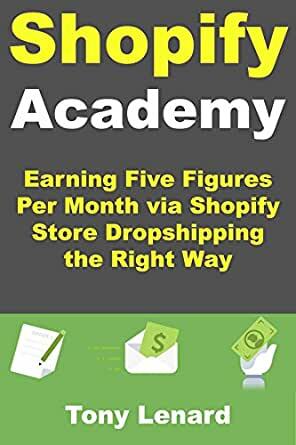 This book gives basic Shopify and FB Ad information to the reader. It gives enough info that you could begin selling on Shopify. The English isn't always perfect, but it's clear enough to understand. I don't know that you'll get to five figures selling with just what's in this book, but you have to start somewhere. Very nicely written and good start to Shopify! I really recommend this book for anybody that is looking to get started like I was!